At 9:00 we said goodbye to Corpus Christi, and began the long and arduous trip home. Our first task? We had to visit Bee County. Even after all I had accomplished the day before, there was still one new courthouse left in this area. Bee County would make #208. From Corpus, we headed northwest for San Antonio on I-37, the same route we’d traveled to get to South Padre Island last summer. 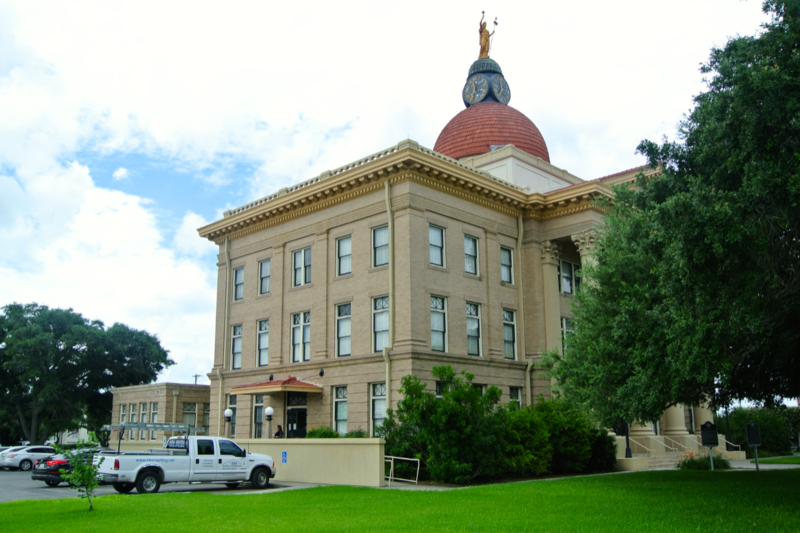 For Beeville (the county seat), we were to exit onto Highway 359 in Mathis. But, we missed that. 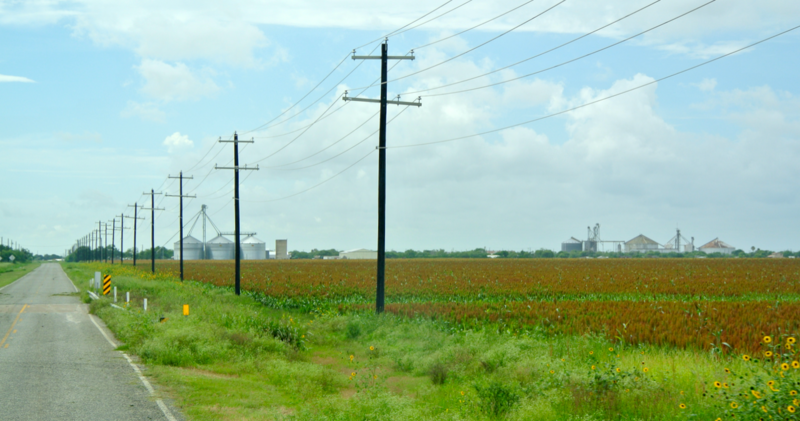 Instead, we had to take FM 352 near the tiny community of Argenta, and navigate a series of other farm to market roads before joining Highway 359, as was originally planned. 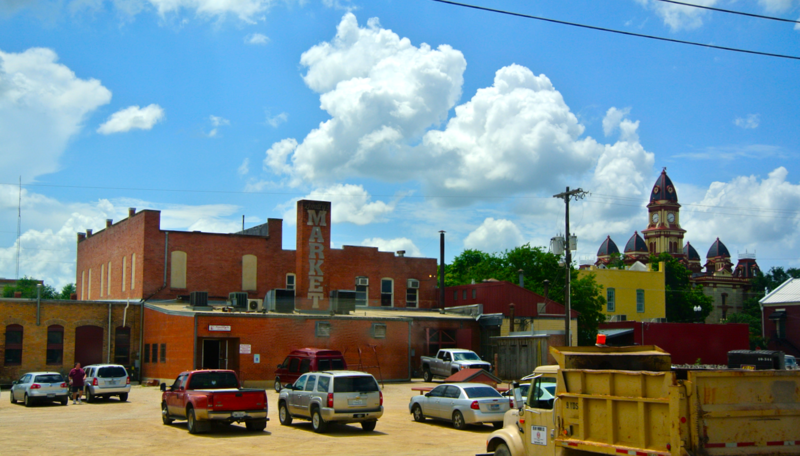 The picture you see above is from our trek through the countryside of Live Oak and Bee Counties. 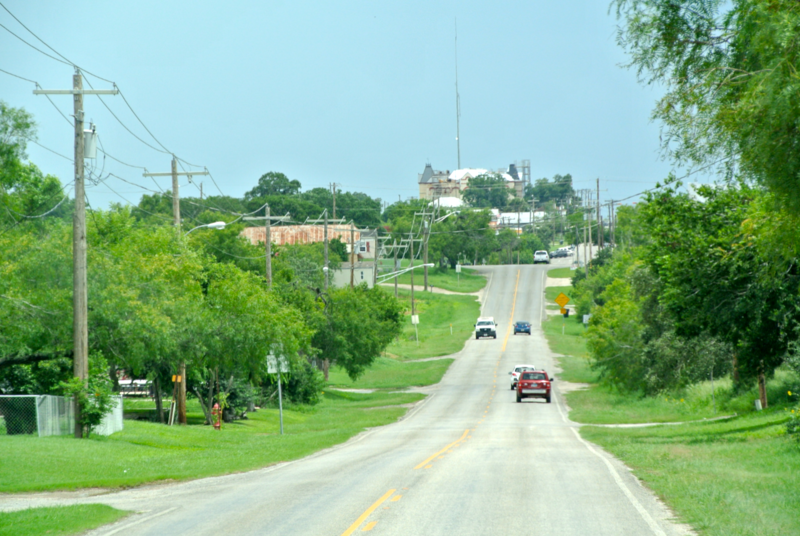 At Skidmore, we turned left on Highway 181, which took us straight into Beeville. 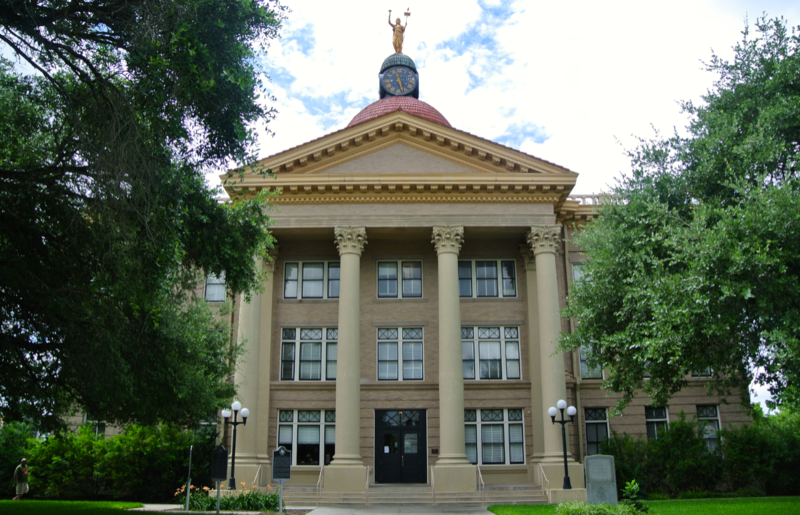 The courthouse is a brick Beaux-Arts creation, dating from 1912. 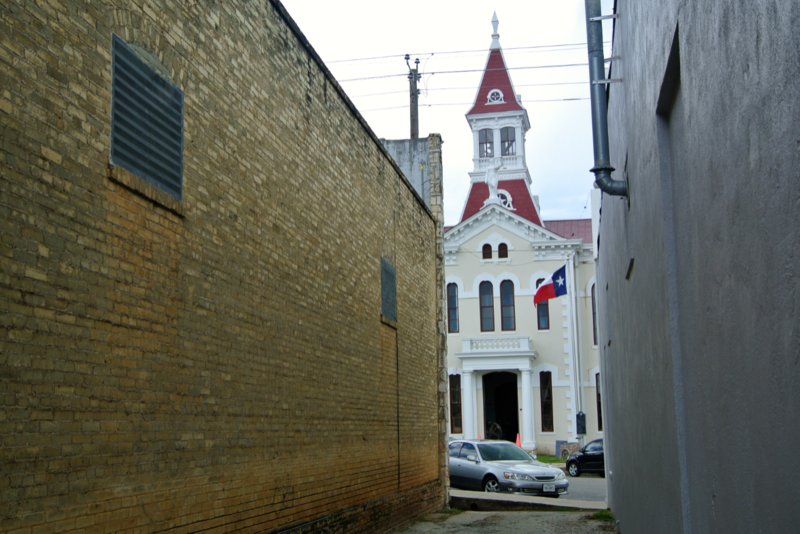 It offers some interesting similarities to the Fort Bend County courthouse in Richmond, designed in the same style (but by different architects) and has some wonderful features. 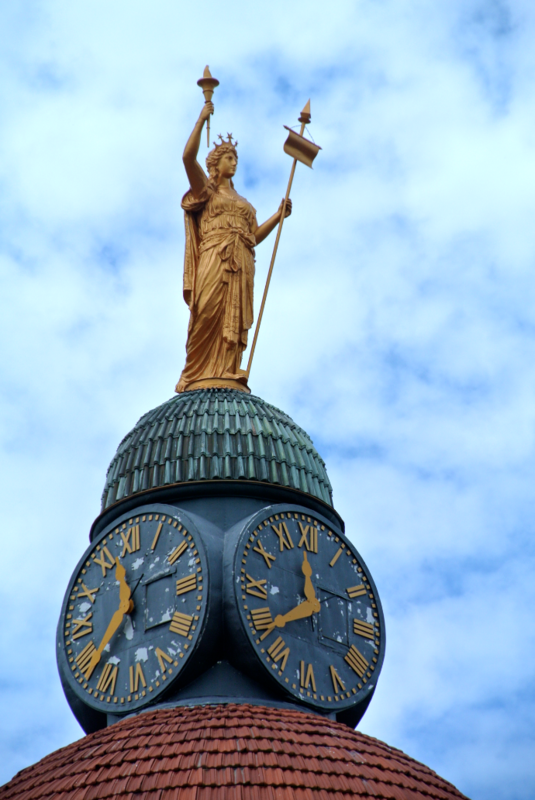 These include a beautiful dome, statue of the goddess of justice, a very unique clock, decorated pediments, and large Corinthian columns. 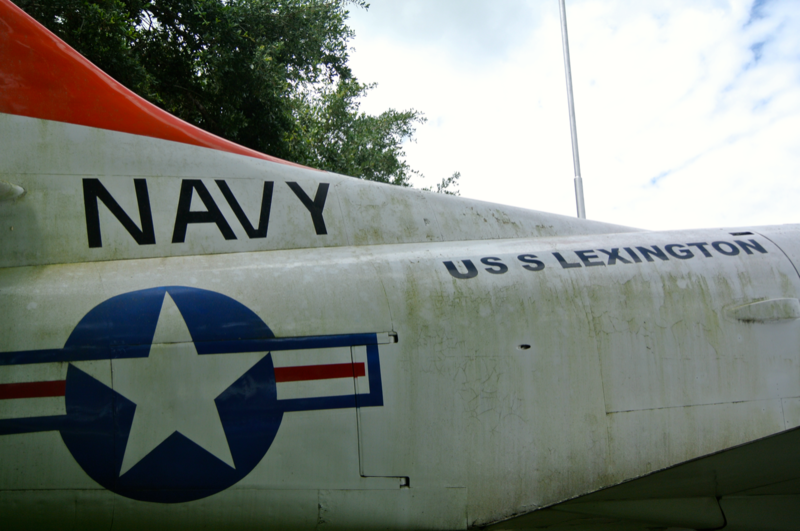 It would seem this one served on the U.S.S. Lexington. 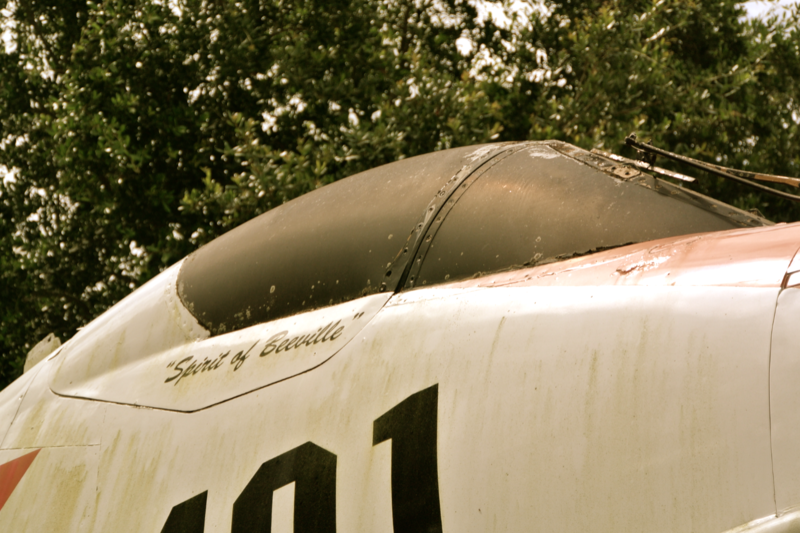 They’ve given it the name “Spirit of Beeville”. 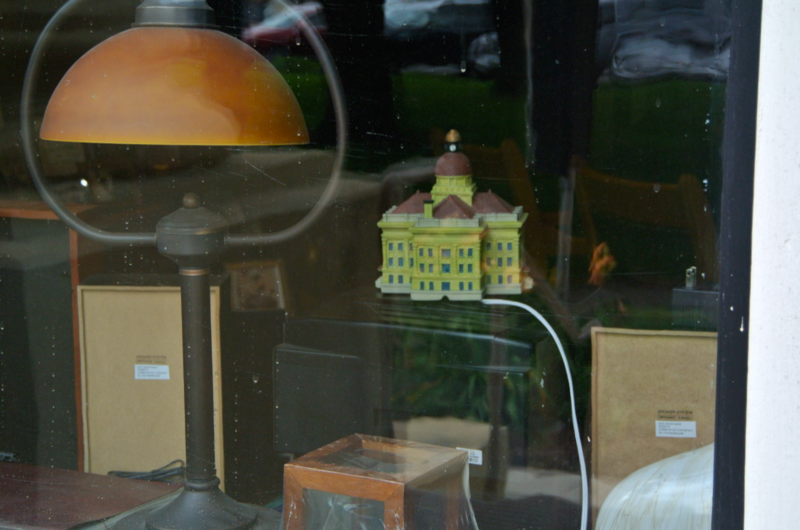 As I photographed the main entrance, I spied this cool lamp through the nearest window. Turns out this is one of the county commissioners’ offices. I’d like to get my hands on one of these, but I have no idea how to go about finding it for sale. 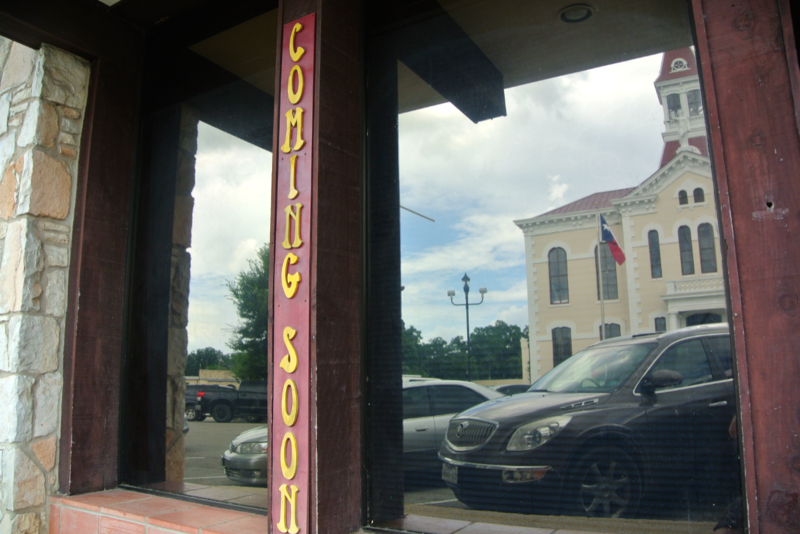 I got lucky once, and found a model of the Bosque County courthouse in a Meridian antique store, but it’s the only such one I’d ever seen until coming to Bee County. 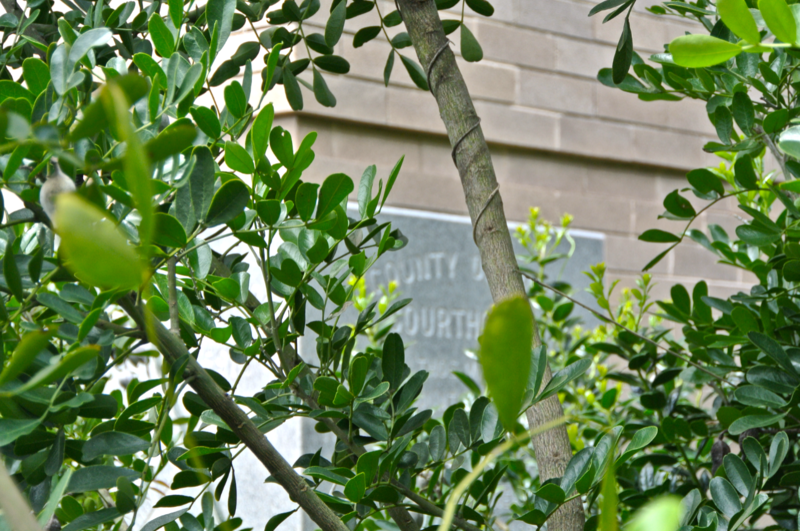 This is the northeast corner, home of the cornerstone. It’s just nearly impossible to get to. There’s a dense garden of foliage and brush separating it from the sidewalk. Regrettably, I couldn’t get through. I found this in the courthouse parking lot. 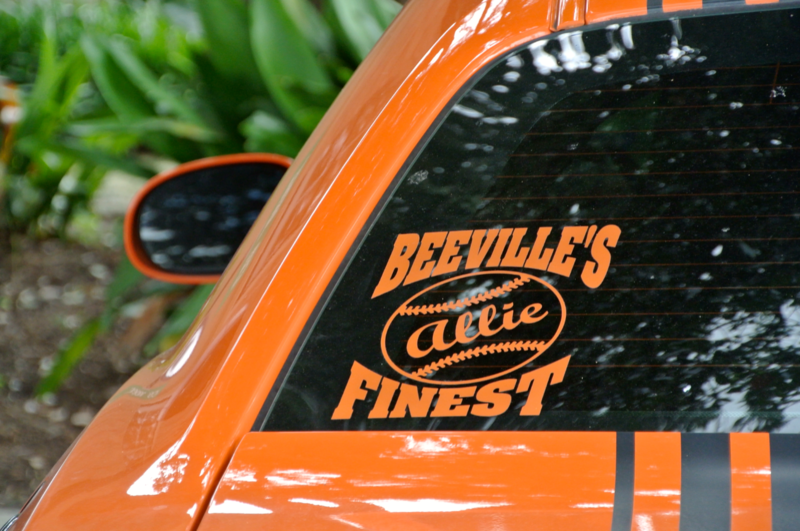 It’s presumably a reference to softball, and not the historic architecture, but I took it to mean how I wanted it to mean. And in that case, I certainly agree! But I wasn’t done for the day, yet. 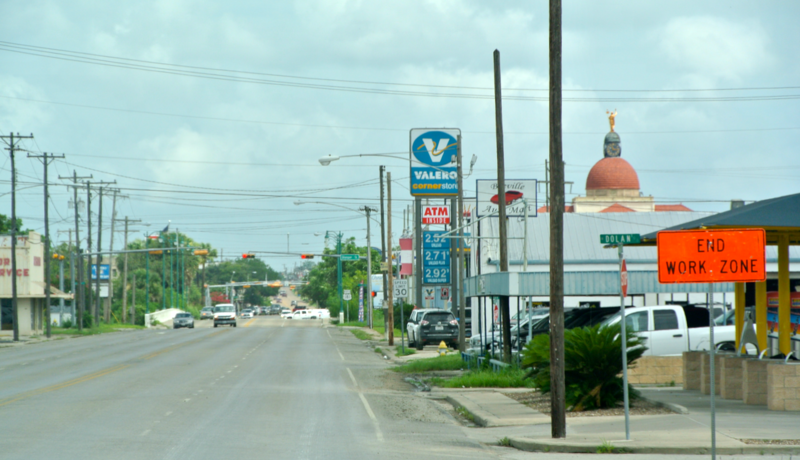 Our route had us passing through two of the redo towns from the March 2012 trip (the same one that included Cuero and Goliad). 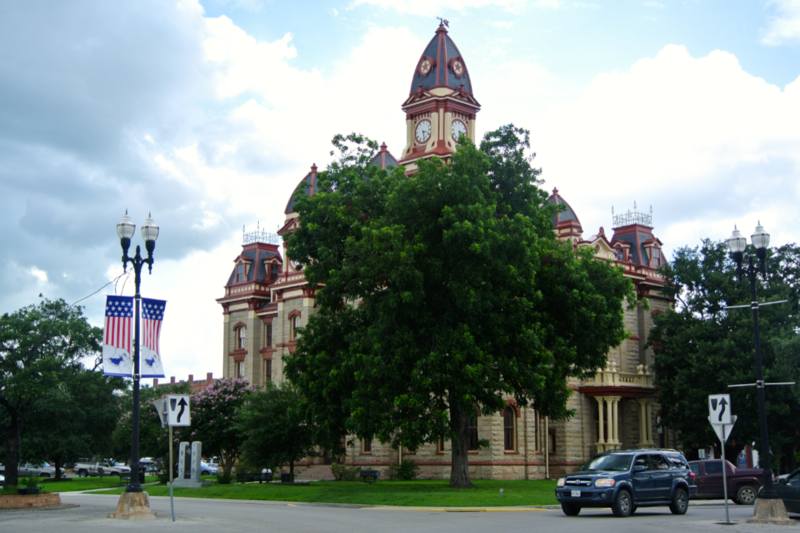 The first was Karnes City (seat of Karnes County), which I recalled was under restoration-related construction when I visited three years ago. I was disappointed to find that three years later, it was STILL flanked by scaffolding. 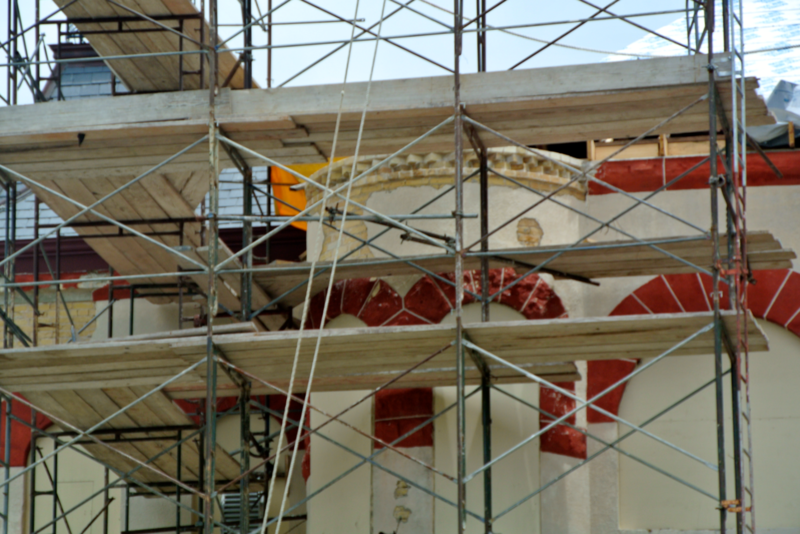 In fact, the scaffolding had spread considerably since 2012. It now stood on three sides, when last time, it had only covered one. 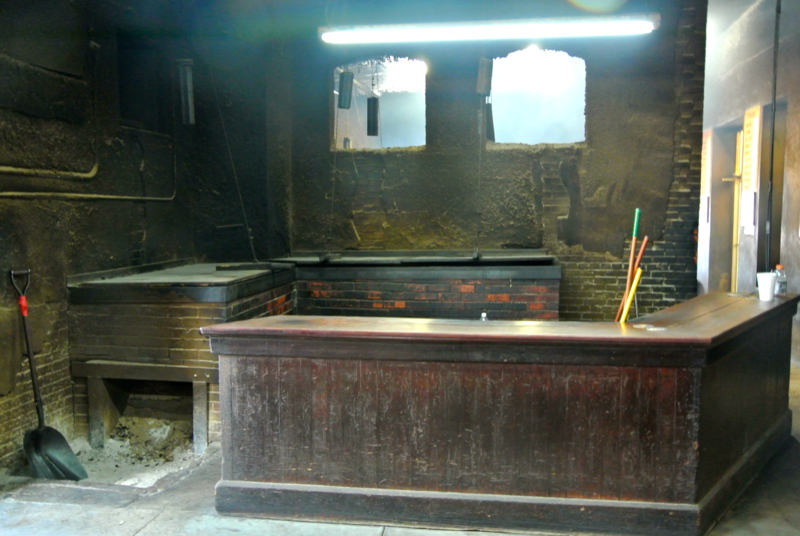 As my pictures (minimal though they were) would attest from my last trip, this side was the one being repaired in 2012. It looks pretty good now. 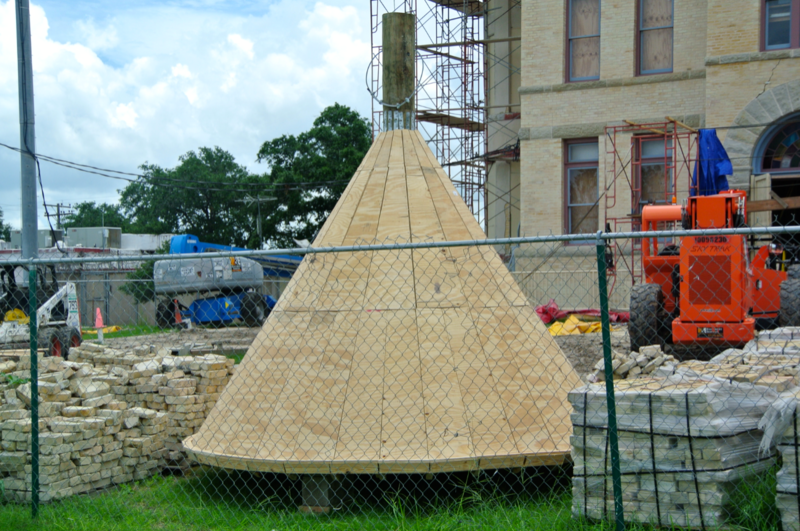 Two of these conical “turret-toppers” were sitting in the yard when I visited, just waiting to be installed. It’s easy to discern where they’ll be placed when the time comes. This building looks like it was in pretty bad shape. 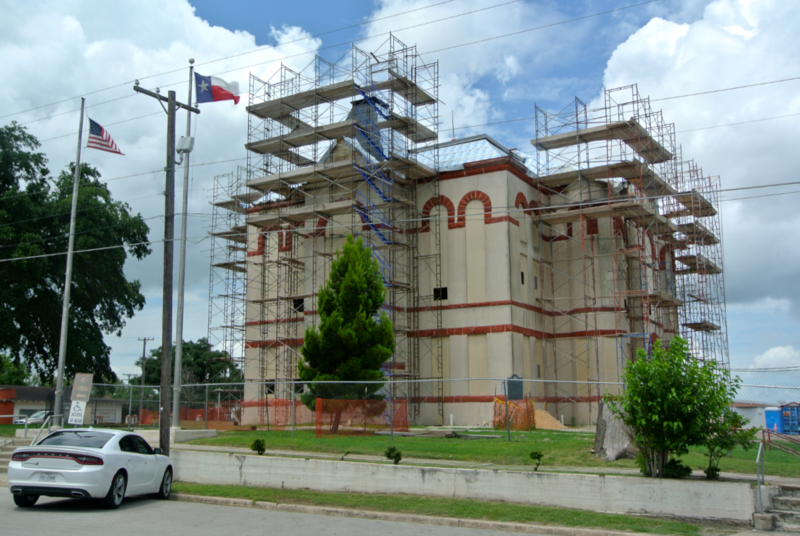 I’m glad that it’s getting its much-needed rehabilitation, but now the THC needs to keep going south on Highway 181 for Corpus Christi and restore the 1914 courthouse, too! 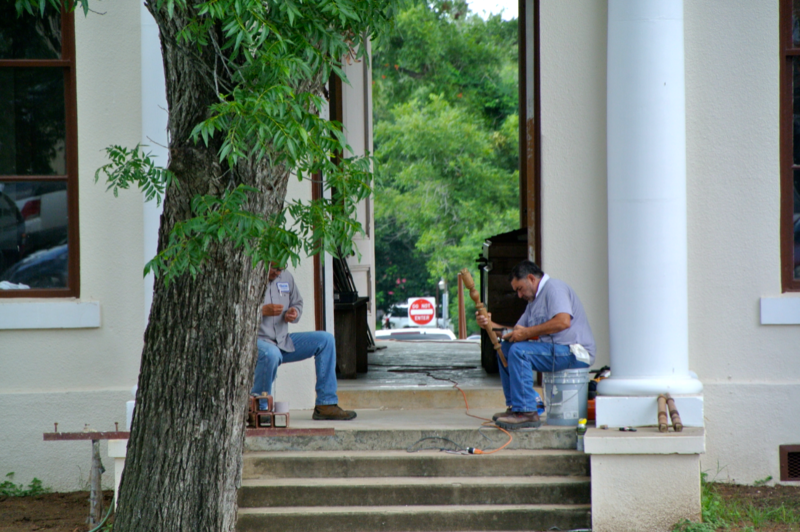 Though it was under construction, I took the pictures I needed and removed Karnes County from my redo list. I don’t plan on coming back to Karnes City ever again. If, in three years, they haven’t finished…who knows when they will? With #49 on the original list complete, we set out to the northwest to redo #50 (Wilson County). 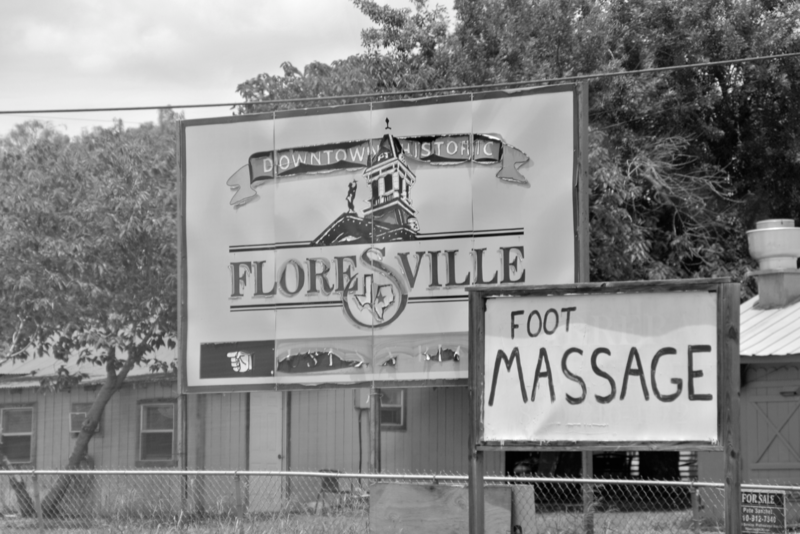 The seat here is Floresville. 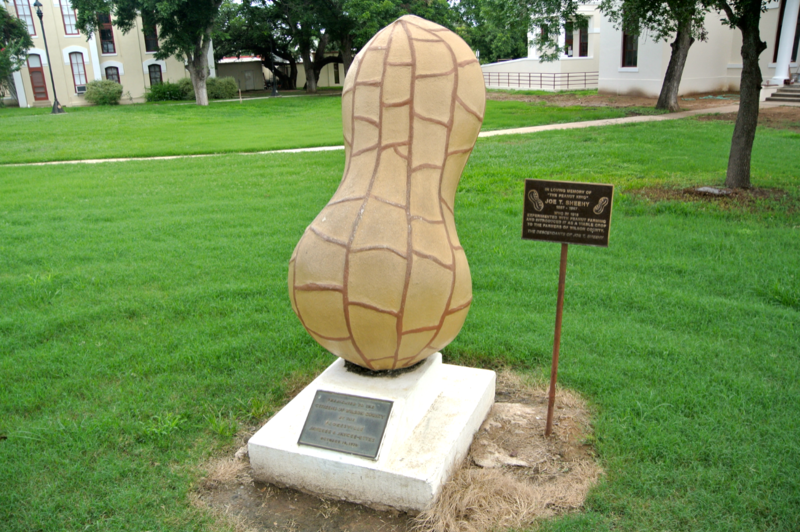 Wilson County is peanut country. The crop was first introduced to the area in 1916 after local farmer Joe T. Sheehy (the “Peanut King”) was successful with an experimental attempt at growing it. 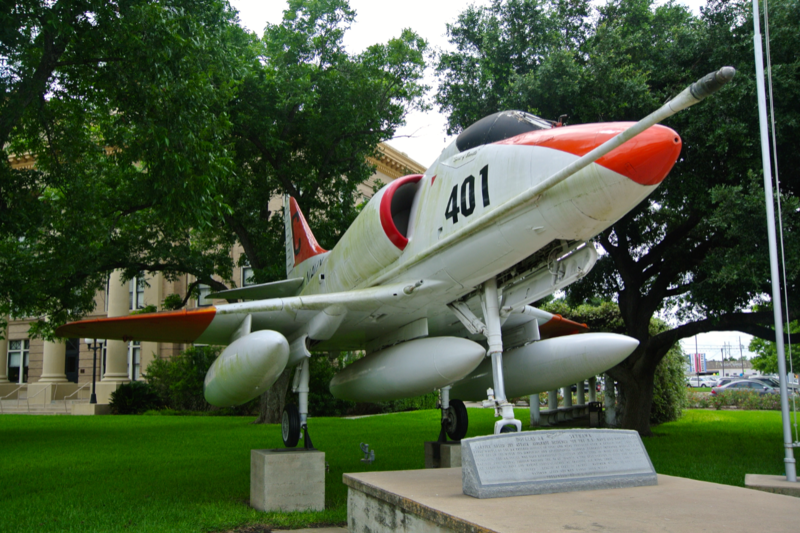 Today, he is remembered with this memorial on the courthouse lawn. 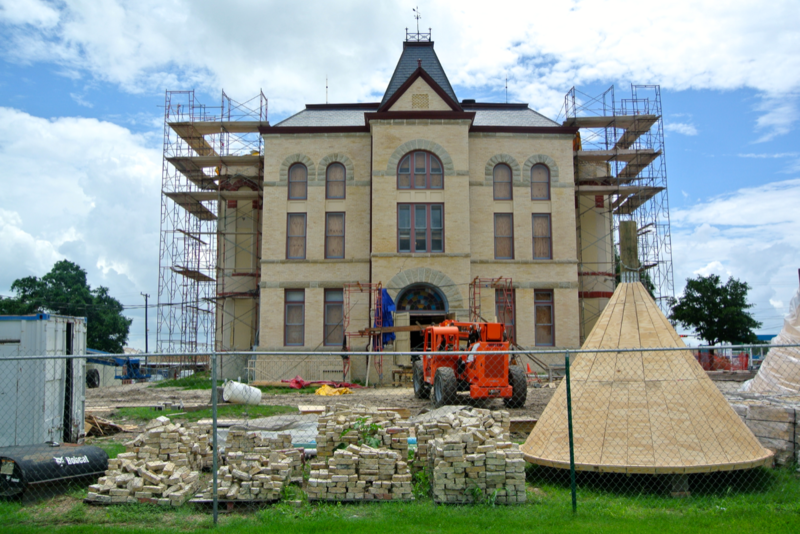 This court building, like the one in Karnes County, was also undergoing a renovation. Luckily for me, though, this only included the interior and didn’t disrupt any photos of the exterior. 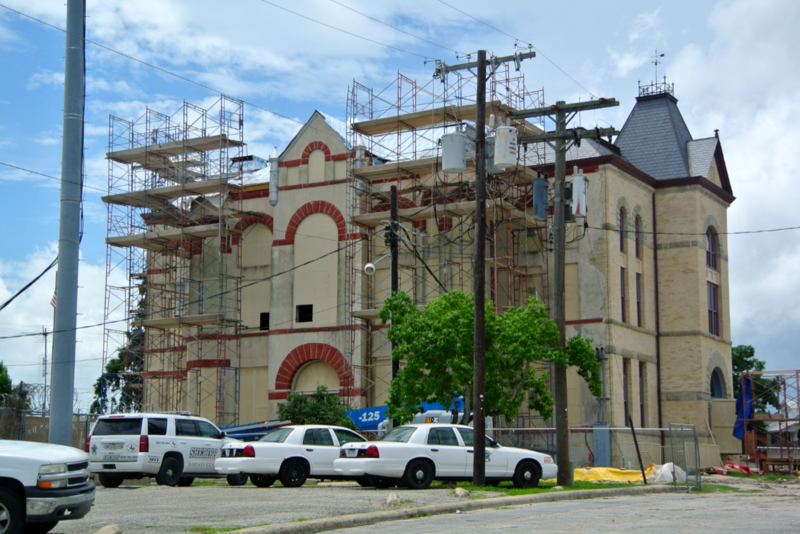 Well, that wrapped up all the courthouses I’d be getting in South Texas. 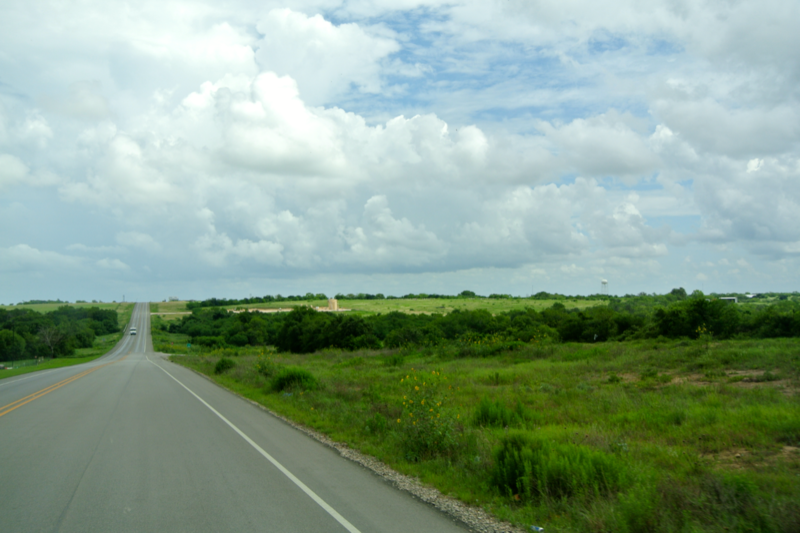 As of the moment I finished rephotographing #50, I had successfully completed every county south of San Antonio. That’s big. On that trip in March 2012 I had visited eight courthouses. 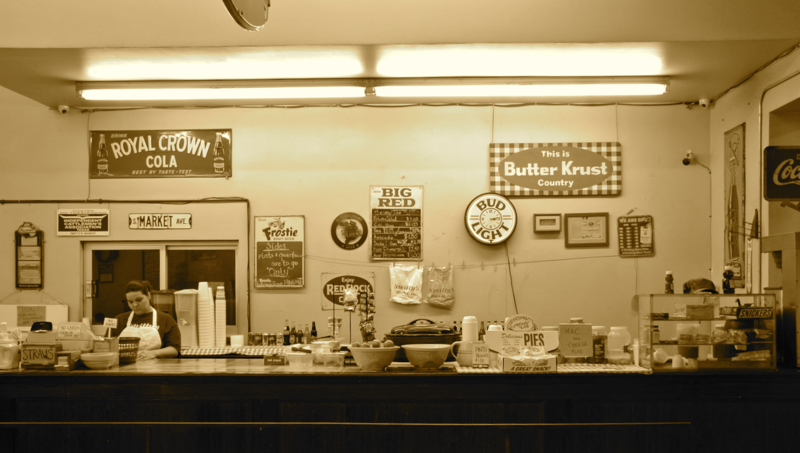 After going back to Wilson County, I’d revisited seven. 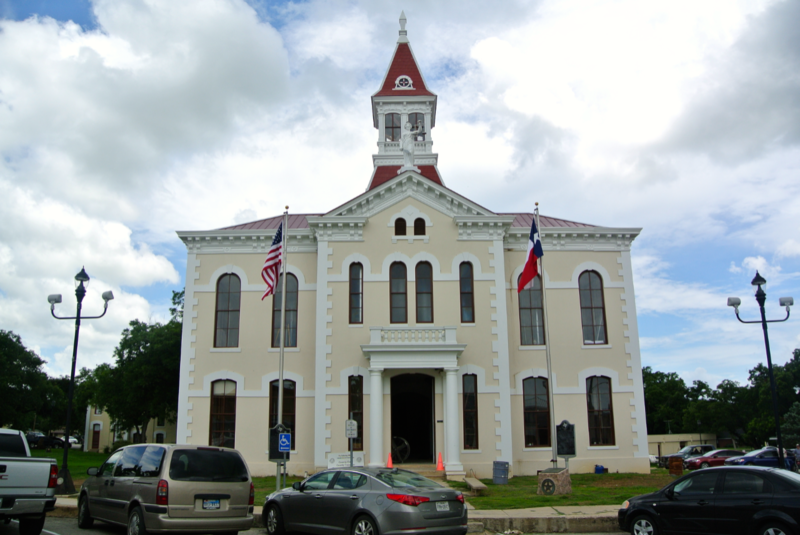 The only one that remains is Guadalupe County (county seat: Seguin), but I plan on returning there when I come back through the area to revisit Bexar, Comal, and Hays Counties. That will probably happen later this summer. Stay tuned. The sun was high in the sky now, and that meant lunchtime. 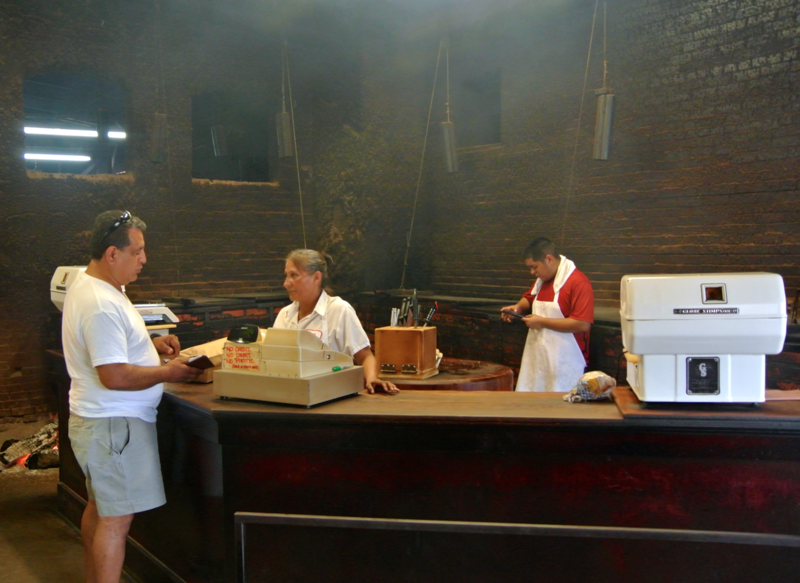 It’s sort of an unwritten tradition in my family that if we’re returning home from South Texas, and it’s possible, we like to eat barbecue in Lockhart. 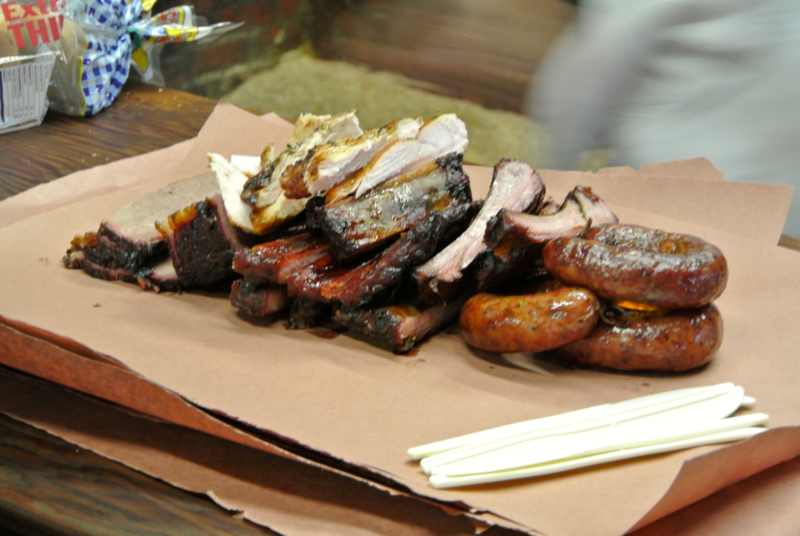 After all, the seat of Caldwell County, is the “Barbecue Capital of Texas”. 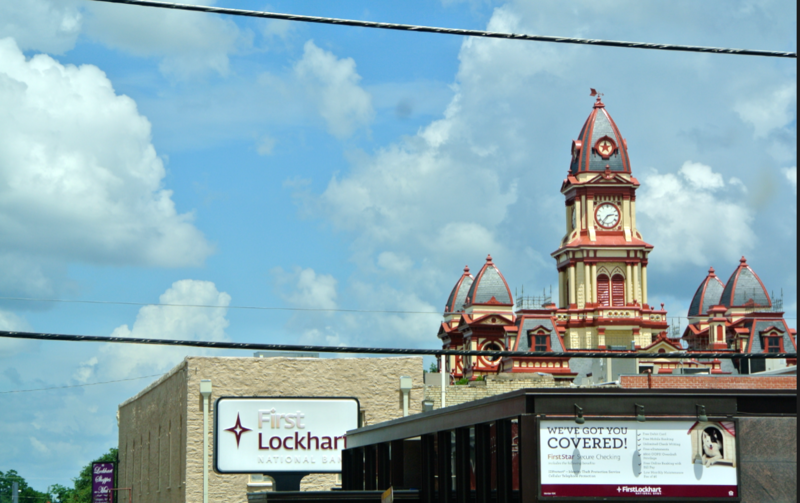 The last time we ate in Lockhart was July 2014, when we were heading south for South Padre Island. At that time, I figured I would revisit the courthouse (as it was on my list), but you may remember that the lens I’d brought with me was a zoom lens. That was a complete accident, and rendered my picture-ability nullified. This time around, however, I had the right lens and was eager to check Caldwell County off as complete. 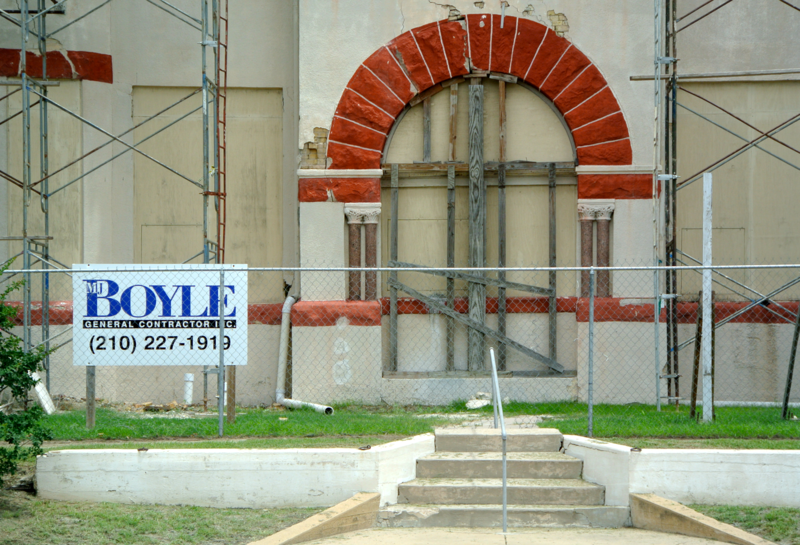 This is a landmark work of Alfred Giles, who designed a sister building to this one in Goliad County. 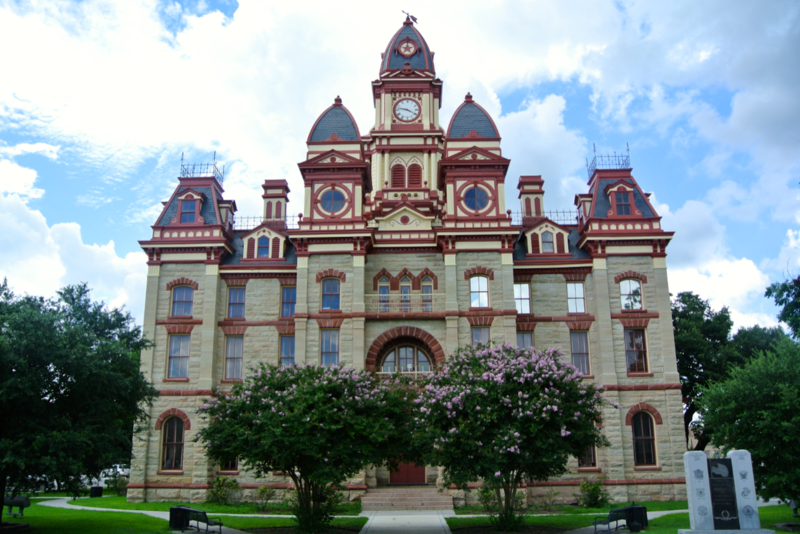 In my opinion, this is one of the most beautiful courthouses in Texas. 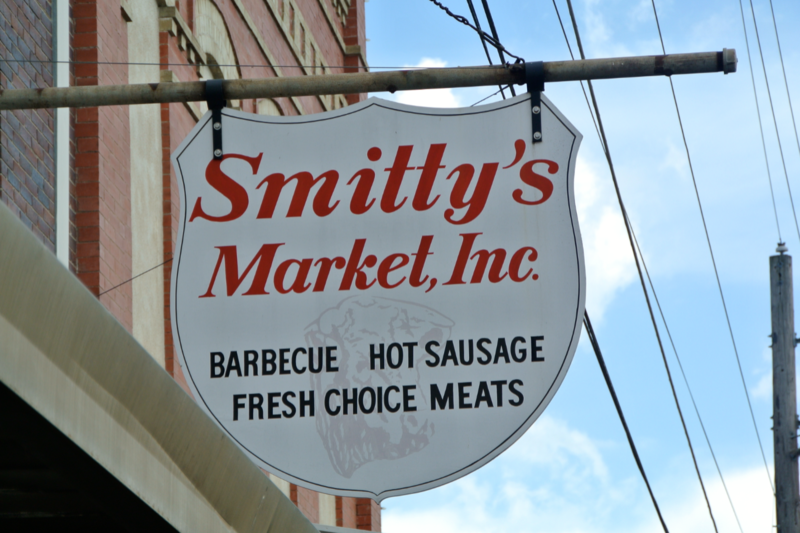 Before I set about photographing, I had lunch at Smitty’s Market. 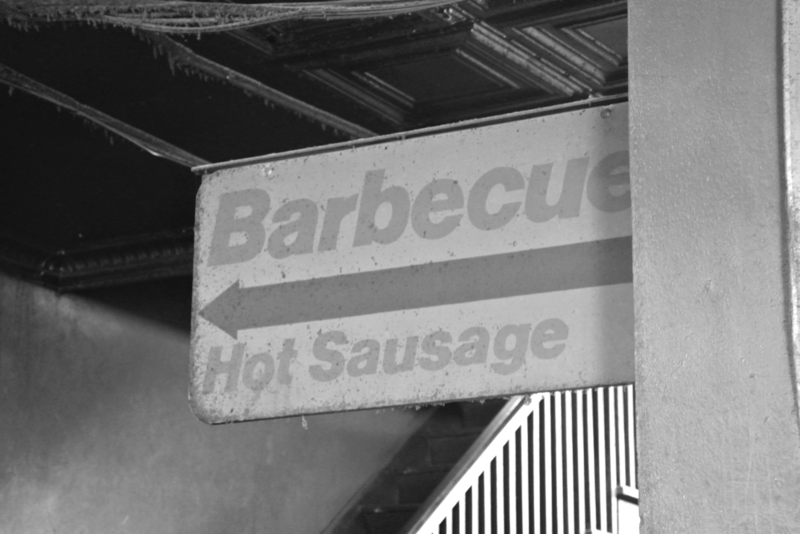 The sausage is the best. After a delicious lunch, I went to take the pictures I needed. 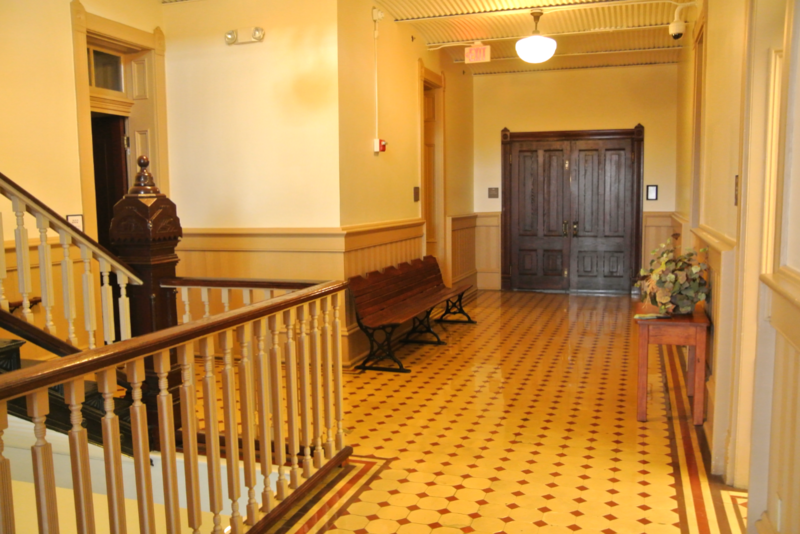 But with his permission, I gathered what I needed on both floors (not including the courtroom, as it was locked), and left. And so that was that. A trip complete with 8 new courthouses, 1 retired courthouse, 5 redos, a battleship, an aquarium, a battleground, a presidio, a monumental gravesite, a statue of an explorer, a coastal ghost town, two restaurants that served delicious food, and a handful of port cities was over. Yet though this trip had ended, the 2015 Courthouse Season had just begun.